Fire ants on boot. Photo by Bart Drees. Fire ant worker ants marked with wire bands. Photo by Bart Drees. Red imported fire ant worker. Photo by Bart Drees. Three red imported fire ant worker ants. Photo by Bart Drees. Red imported fire antworker ants. Photo by Bart Drees. Winged reproductive fire ants leaving mound on nuptial flight. Photo by Bart Drees. 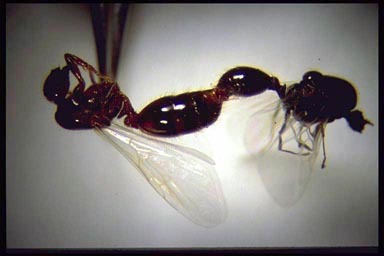 Mating red imported fire ants. Photo by Charles Barr. Dissected red imported fire ant queen showing spermatheca. Photo by Bart Drees. Worker ant holding clutch of eggs. Photo by Charles Barr. Eggs, larval stages, pupa and adult fire ant workers. Photo by Bart Drees. Larval (top) and pupal fire ants. Photo by Bart Drees. Electron micrograph of fire ant larvae. Photo by S.B. Vinson. Array for red imported fire ant worker sizes. Photo by S. Porter. Fire ant castes and developmental stages from a “mature” colony. Photo by Charles Barr. Worker ants tending queen. Photo by S.B. Vinson. Fire ant laboratory colony. Photo by Bart Drees. Worker ants tending larvae and queen. Photo by Bart Drees. White ant “eggs” (actually larvae and pupae) in disturbed ant mound. Photo by Bart Drees. Small imported fireant colony appearing several weeks to months following a mated queenbeginning to develop a colony. Photo by Bart Drees. 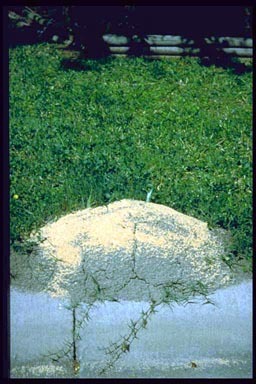 Six-inch diameter ant mound in lawn. Photo by Bart Drees. Profile diagram of imported fire ant mound. Texas Cooperative Extension file photo. Red imported fire ant mound. Photo by S.B. Vinson. Red imported fire ant mound, cut-away Photo by Bart Drees. Tall red imported fire ant mound. Texas Cooperative Extension file photo. Red imported fire ant mound in flower bed. Photo by Bart Drees. Red imported fire ant mound in sidewalk crack. Photo by Bart Drees. Red imported fire ant mound next to sidewalk. Photo by Bart Drees. Red imported fire ant mound next to tree trunk. Photo by Bart Drees. Red imported fire ant mound at base of mail box support pole. Photo by L. Adams. Red imported fire ant mounds in front lawn. Photo by Bart Drees. Red imported fire ant mounds in pasture. Photo by Bart Drees. Red imported fire ant mound in poor, compacted soil. Photo by Bart Drees. Multiple queen (polygyne)red imported fire ant mounds marked with field flags for research. Photo by Bart Drees. Red imported fire ant foraging trail. Photo by Bart Drees. Red imported fire ant colony floating in flood water. Photo by Bart Drees. Red imported fire ant colony emerging from flood water. Photo by Bart Drees. Red imported fire ant foraging trail into dry rice field. Photo by Bart Drees. “Bone pile” of dead ants that commonly occur near fire ant mounds during hot, dry periods. Photo by Bart Drees. Venom sac and stinger, diagram. Texas Department of Agriculture file photo. Venom sac and stinger. Texas Department of Agriculture file photo. Fire ant worker biting and stinging. Texas Department of Agriculture file photo. 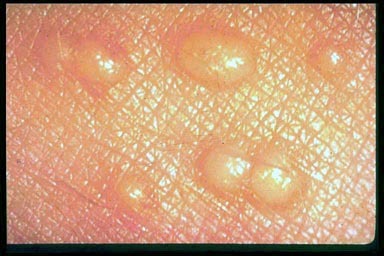 Pustules, blisters formed following fire ant sting, close-up. Photo by Bart Drees. Pustules, blisters formed following fire ant sting on leg. Photo by Bart Drees. Pustules, blisters formed following fire ant sting on ankle. Texas Department of Agriculture file photo. Pustules, blisters formed following fire ant sting on hand. Texas Department of Agriculture file photo. 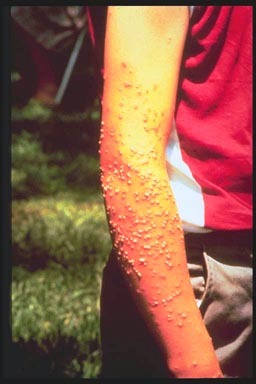 Pustules, blisters formed following fire ant sting on arm. Texas Department of Agriculture file photo. Secondary infection following fire ant sting on hand. Texas Department of Agriculture file photo. Fawn with fire ant sting scars on head. Photo by Bart Drees. Calf eyeball showing fire ant stings on pupil. Photo by J. Joyce. Rumen content from calf that suffered fire ant anaphylaxis. Photo by Catherine Barr. Tricolor heron chick being attacked by fire ant workers. Photo by Bart Drees. Pink bollworm being attacked by fire ant workers. Photo by Winfield Sterling. Fire ant worker attacking corn earworm. Photo by Winfield Sterling. 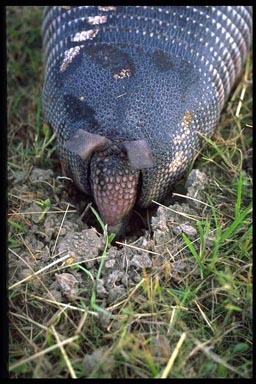 Armadillo digging into fire ant mound. Photo by Bart Drees. Fire ants “tending” mealybugs. Photo by Bill Ree. Fire ants feeding on plant nectary. Photo by S.B. Vinson. Fire ants feeding on okra bud. Photo by Bart Drees. Fire ant damage to base of corn plant. Photo by J.W. Stewart. 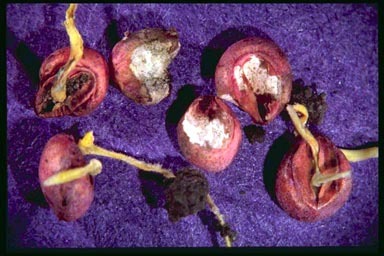 Fire ant damage to sorghum seeds and seedlings. Photo by Bart Drees. Fire ant colony infesting flower pot. Photo by Bart Drees. Hay cutting delays can be caused by fire ant mounds. Photo by Bart Drees. Fire ants move into hay bales, particularly after flooding rains. Photo by Bart Drees. Fire ant in electrical utility housing. Photo by S.B.Vinson. Fire ant in electrical utility housing. Photo by S.B. Vinson. Fire ants in relay switch box from traffic box. Photo by Bart Drees. Fire ant mound next to curb treated with a granular products at higher than recommended rate and not watered in. Photo by Bart Drees. Applying dust-formulated insecticide to fire ant mound. Photo by Bart Drees. Liquid drench applied to fire ant mound. Texas Cooperative Extension file photo. Applying drenches to research plots with fire ant mounds marked with field flags. Photo by Bart Drees. Applying liquid insecticide spray to pecan orchard floor. Photo by Bart Drees. Applying granular insecticide to turf/sod farm. Photo by Bart Drees. Manually operated ant bait spreaders. Photo by Bart Drees. Applying ant bait using manually operated spreader next to water. Photo by Bart Drees. Applying ant bait using manually operated spreaders to horse pasture. Photo by Bart Drees. Applying ant bait using utility vehicle mounted electric seeder. Photo by Bart Drees. Applying ant bait using tractor-mounted electric seeder. Photo by Bart Drees. Electronic seeder to apply ant bait mounted on a granular fertilizer spreader. Photo by Bart Drees. Loading ant bait into crop duster modified for applying proper rate of product. Photo by Bart Drees. Aerial application of ant bait using crop duster. Photo by Bart Drees. Homemade pallet witha variety of ant-attractive food substances for monitoring presenceof fire ants and other ant species. Photo by Bart Drees. Little black ants attracted to peanut butter. Photo by Bart Drees. Carpenter ants attracted to moistened sugar. Photo by Bart Drees. Black carpenter ant. Photo by Bart Drees. Carpenter ants. Photo by Bart Drees. Carpenter ant. Photo by John Jackman. Texas leaf cutting ant mounds. Photo by Bart Drees. Texas leaf cutting ant, winged male. Photo by Bart Drees. Texas leaf cutting ant, worker carrying leaf. Photo by John Jackman. Pyramid ant mound. Photo by Bart Drees. Red harvester ant nest Photo by Bart Drees. Red harvester ant workers. Photo by Bart Drees. Pharaoh ant. Photo by Bart Drees. Crazy ant. Photo by Bart Drees. Big-headed ant. Photo by Bart Drees. Odorous house ant. Photo by Bart Drees. Acrobat ant. Photo by Bart Drees. Ghost ant. Photo by Bart Drees. Pavement ant. Photo by Bart Drees. Pavement ants attacking fire ant queen. Photo by Bart Drees. Little black ant. Photo by Bart Drees. Little black ants attacking fire ant queen. Photo by Bart Drees. A cow killer or “velvet ant,” a wingless wasp. Photo by Bart Drees.